A couple more presents for some lovely friends...this time purple-themed. Notes: This is quite a bit smaller than the original due to the amount of yarn I had. I left out some of the stockinette at the end as well as much of the garter stitch border. So it's more of a kerchief than a shawl. But it's enough to be pretty cozy. Also, I LOVE this yarn. Notes: 2,690 people can't be wrong...this is a great pattern. And being able to use up every little bit of this gorgeous yarn and not wasting even an inch made me very, very happy. Up next: Knitted Christmas gifts for pets (because, you know, they celebrate the holidays, too). your holiday knitting puts the rest of us to shame. what lucky family and friends you have! 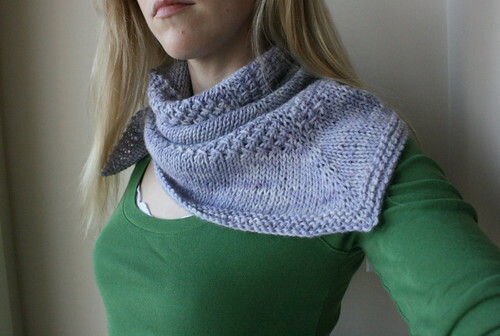 love that textured kerchief -- and i am mid-baktus as we speak! I love that Textured Shawl Recipe one! It's gorgeous. I might have to go add that one to my queue. Am sure both friends were happy. I love those little shawly scarf things! you knit so many great gifts this year! So pretty! Beautiful yarn! It must have been very pleasant! And the receipients must be very proud to wear these precious hand-made gifts! So pretty! The colours are great. And how satisfying is it when you use up all the yarn and have none left over... I'm beginning to hate the dozens of small leftover balls I've got kicking around... I keep telling myself I'll do a scrappy lengthwise scarf with them one of these days, but I'd prefer to not have the leftovers to begin with! i am always so behind the cool knitters. you and 2,960 people remind me of this. Great gifting projects ~ beautiful and warm and easy to wear! Love the yarns you selected for each of these projects as it brings out the best in each. Roll on the pet knits!!! Beautiful knits! I love Felix's sweater over there on the side, too.